We love making homemade paint. 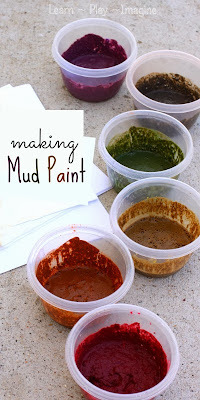 Of course we buy store bought paint, too, but it's so much fun trying new recipes for homemade paint and experimenting with colors and textures. 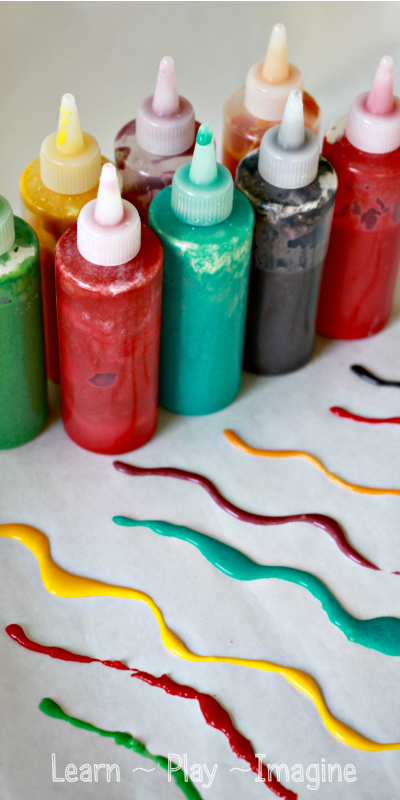 Our favorite paint recipe that we have tried is Homemade Puffy Paint. The paint recipe calls for three common household ingredients. All you have to do is mix up a batch then add the color of your choice, and voila you have a simple no cook puffy paint recipe. We almost always have a batch of homemade puffy paint in the fridge. It lasts for months and is ready for use at a moments notice. We have been having so much fun adding Kool Aid to sensory play, and we even made Kool Aid watercolors for a recent play date. The aromas a Kool Aid packet add to paint makes it an amazing sensory experience. The added bonus is that Kool Aid also adds rich colors, so this paint recipe remains a frugal one. 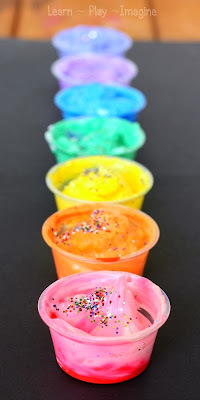 I mixed one packet of Kool Aid or Duncan Hines frosting creations (to get colors I couldn't achieve with Kool Aid) and 1/3 cup of water then poured the mixture into each squeezy bottle as pictured above. After mixing the Kool Aid packets and water I added equal parts of salt and flour to each squeezy bottle using a funnel. I covered the bottle opening with my finger and shook hard until all the homemade paint was well blended. The desired consistency is liquid enough to squeeze out easily and solid enough to be puffy. I squirt out small amounts in the kitchen sink until I am satisfied with the results. The recipe is roughly equal parts of water, salt and flour, but I mix well and add ingredients as needed until I achieve the desired consistency. I prefer to start with excess liquid, because it is easy to squeeze liquid off the top when necessary. It can be more difficult to water down flour and salt if too much of the dry ingredients are added first. *Note* If you don't have a funnel you could also mix the ingredients in a ziploc bag then cut a small opening and squeeze in the paint through the small hole. All four of my boys love homemade puffy paint. J-Bug (4) prefers to squeeze out large amounts of the paint and watch the colors blend together. Lately JZ (6) has been working hard to make pictures with the homemade paint. His drawing skills have really developed, and it's fun watching him transfer them to paint. We've almost made chocolate puffy paint, candy apple scented puffy paint, and candy cane puffy paint. I can't wait to try this recipe. I just threw out a bunch of our paint that was getting dried up and now I feel like we have no paint in the house. This is the perfect recipe to build up my paint supply. Does it last? Yes it dries hard and lasts for many months. You can hang a painting on your wall. We have a few hanging upstairs that our boys have made with these paints. Just leave it flat to dry. Sometimes, pieces flake off, but usually only when my kids squeeze copious amounts out at once. Just wondering Alison when you say 'mix the koolaid' does that mean you follow the directions on back and add a pound of sugar then do your following steps or you just mix it with water? I have dyed my hair with kool aid in the past, does this paint stain clothing/walls? I'm not sure if it would stain the walls. We've never had any on our walls. We've also never had an issue with staining clothes. I always check the clothes before moving them to the dryer to be sure all spots are out before drying.